Giveaway: Win A Whitmor 5-Tier Acrylic Beauty Organizer! Beauty is a slippery slope, friends. My makeup used to be able to be contained in a single bag. Now, it’s amassed into an amorphous blob on top of my vanity. I like to see my current, in-circulation favorites, but spilling them out of a cosmetics clutch daily is more work than I need to be doing, frankly. 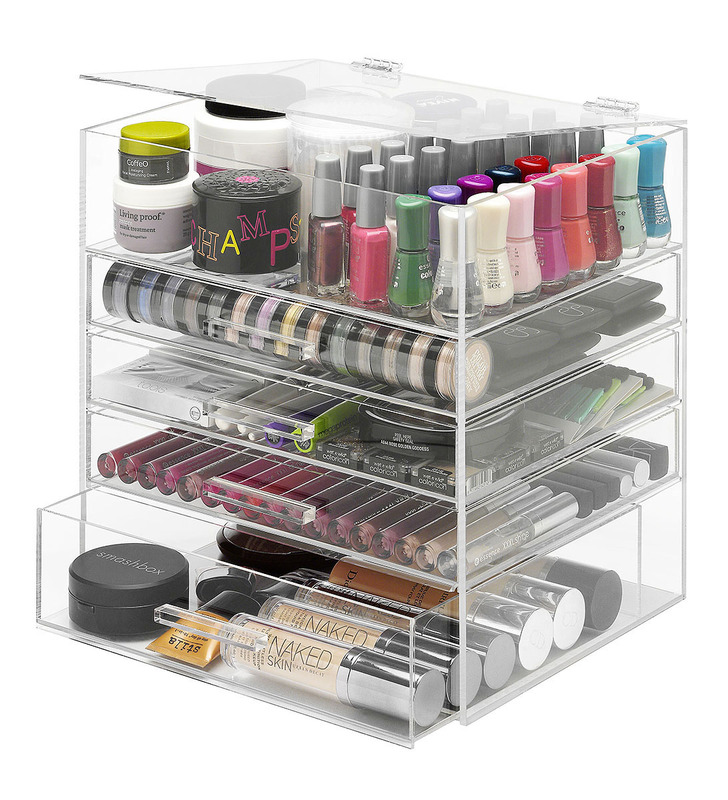 So when I got offered a sample of the Whitmor 5-Tier Acrylic Cosmetic Organizer ($99 on Amazon), I was elated. It’s transparent, so I can see all the items I’m testing but is neat enough and stacks multiple drawers, so it takes up a relatively tiny amount of counter space. 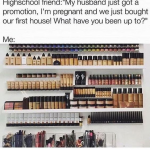 It’s transformed my makeup organization from chaos to calmly collected and boasts a ton of space for all my items from foundations to fierce glosses. The good news? I’m giving one of these bad boys away to one lucky reader. Here’s how to enter. 1. Comment on this blog post. 2. “Like” Rouge18 on Facebook if you haven’t already and leave a comment about beauty organization. 4. Follow me on Instagram (@Rouge_18) and comment on a photo. That’s it! This giveaway is US-only. The winner will be chosen at random and announced on this post on Monday, November 24. The deadline is Sunday, November 23 at 12pm ET. UPDATE: Dana (whose email begins with balex1971) is the winner! Congrats, Dana! P.S. For closet organization, I’m all about these Large Tint Stacking Drawers from Container Store. 49 Comments → Giveaway: Win A Whitmor 5-Tier Acrylic Beauty Organizer! I LOVE SAMPLES MYSELF, AND I HAVE SO MUCH MAKE UP IT HAS JUST TAKEN OVER OUR COUNTER!! I WOULD LOVE THAT BAD BOY! WITH IT BEING CLEAR IT’S GREAT U CAN SEE WHAT U HAVE AND EACYLY WERE IT IS! AND END THE ‘DO U NEED ALL OF THAT?” CAN’T WAIT TO HEAR WHO WINS!! THANKS FOR THE CHANCE!! I’ve always wanted acrylic organizers, but they can be a bit pricey. This would make some easier times for my dresser and keep the hubby happy 😉 just saying! I would really love to win this.It is such.a wonderful giveaway. Would absolutely LOVE to win this; I’ve been looking everywhere for the perfect makeup organizer since I lost mine when we lost everything in the 9/2013 floods…..right now I’m using a fishing tackle box for my nail polishes and nail supplies!! This would be so useful to organize my growing makeup collection. Thanks for the great giveaway! With 3 women using one bathroom, organization is a must. We’ve got a process figured out but this would be so much easier. I absolutely love the organizer. I would like to give it to my daughter so that she can keep her make up in tip top order for once. I would really like to win this awesome organizer for my daughter and give it as a gift. I need this badly.. I would be nice if my bathroom could be much neater and organized! Love to be organized. This takes it to a new level wit visibility also. NICE. Thanks for a chance to win beautiful prize. I would love to have this in my bathroom counter so my cosmetics would be organized and I could actually find items when I want them or need them! Tried of digging through drawers and random boxes to find things. I would love to win a Whitmaker 5-tier acrylic beauty organizer. Love love love this! Also love how you can see all of your makeup! Awesome giveaway! I need this, so bad! Thank you for the chance to win! Amazing! Would love to have yhis to ckear up my clutter. I have never even seen one of these,but I’m in love with it. Thanks for the opportunity! I would love to have this, I have so much make up and beauty products could really use this. Thanks for the opportunity, this is a great giveaway! I have 2 daughters and with sharing the make-up (the safe stuff) you can imagine the chaos that ensues. An organizer would be an absolute godsend on the cosmetic front. Thank you! Now this is definitely something my daughter needs! The makeup addiction has taken over an entire table top, lol! I’m currently in a rehabilitation facility and anything that organizes my things is needed and welcomed! i would like to win plzzz!!! Followed on FB and left comment on giveaway post–Evans B.
I’ve been wanting one for a while now, but just can’t buy them, they’re too expensive! Thanks for the chance! It’s extremely likely I’m the most unorganized girl anyone could possibly know. The thing is, I am seeking help & this would do just that and more! 🙂 Thanks for the chance! I have been wanting this Acrylic Organizer. This could help me out and pick out and see clearly at what I want to use and not make a big mess. I need to have this! Really! I love the idea of winning this make up organizer! Thanks for giving us the chance to win. What an amazing giveaway opportunity. I love that it is see through and you can easily see what you need without messing everything up. My storage recently suffered a crack so it would be great to get up to date especially with such a high quality product such as this. Perfect for all your beauty products. Will keep all my stuff organized! It’s official. I need this. For the sake of a happy marriage:) lol. I’m so excited about this giveaway! What beauty lover wouldn’t want one of these? This is a great giveaway and I would love to win! I need to organize more of my makeup and this would be perfect. I would LOVE this<3!!! My makeup is all over the place and it is so annoying especially for a neat freak like myself:/ Thank you so so sooooo very much this is so kind, generous, and AMAZING of you THANK YOU:D!!!!! !